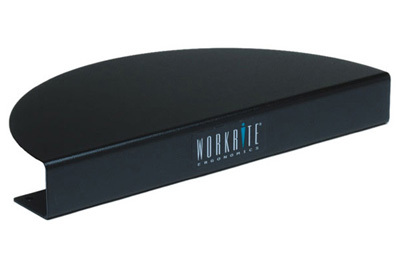 The Workrite Revo Keyboard Tray System is a popular solution for those who prefer to use the mouse positioned over the 10-key pad, or for users with limited reach. Revo is adaptable to fit virtually all workstation shape and size requirements. Mouse platform offers generous area to minimize reach and tilts independently from keyboard platform for customized control. Works well in both straightaway and corner workstations. The Revo platform can comfortably adjust to the reach requirements of short as well as tall computer users. Mouse platform can be quickly switched from right to left side, enabling users to alternate mouse positions and reduce muscle strain. The ¼” Ultra-Thin™ phenolic platform minimizes the distance between the forearm and thigh, providing a greater range of ergonomic fit. The Revo keyboard platform also features the Optimizer™ with built-in document holder and cord manager. The Revo System meets or exceeds the ANSI/BIFMA standards for performance, durability, and cycle testing, and is backed by Workrite’s Limited Lifetime Warranty. Unique mouse platform with Mouse-Over, Mouse-Forward, Mouse-Back and In-line positions for maximum flexibility and comfort. Mouse platform tilts independently from keyboard platform. Stylish No-Slip keyboard mat and mouse-trap keep keyboard and mouse in place. Integrated sliding document holder and cord management included. Low profile arm provides maximum knee clearance. All Workrite Revo Systems exceed LEED requirement MR4.2 (20% recycled content) and may be eligible for up to 2 points. Ultra-Thin platform surface made from GREENGUARD® certified materials. *At the most forward position, the mouse platform extends 2.5" from the front edge of the wrist rest.